Col. Mark James Alexander was the only airborne officer to lead three different battalions into combat in World War II, successively commanding the 2nd and 1st Battalions, 505 Parachute Infantry Regiment, and the 2nd Battalion, 508 PIR, of the 82nd Airborne Division. Col. Mark James Alexander was the only airborne officer to lead three different battalions into combat in World War II, successively commanding the 2nd and 1st Battalions, 505 Parachute Infantry Regiment, and the 2nd Battalion, 508 PIR, of the 82nd Airborne Division. A legend in his own time, he fought in North Africa, Sicily, Italy, and France, and even after being seriously wounded in Normandy, insisted on playing a role in the Battle of the Bulge. Airborne Generals Gavin and Ridgway recognised Alexander’s superior battle skills and were more than happy to use him to plug holes in the ranks. His reputation excelled among the rank and file, right down to the lowest private. He led from the front, pressing the attack while simultaneously looking out for his men. In Sicily, Alexander’s battalion landed 25 miles from its drop zone, into a network of Italian pillboxes, upon which the Colonel personally directed fire. Dropped into the desperate inferno at Salerno, he refused to give ground against German counterattacks, forming his paratroopers against enemy efforts to push Allied forces back into the sea. At Normandy one seasoned lieutenant, John “Red Dog” Dolan, 505 PIR, called him “the finest battalion commander I ever served under,” after Alexander had led the 1/505 for ten days through the bloody battle for La Fière Bridge and Causeway. This memoir is based on the transcription of hundreds of hours of recorded interviews made by Alexander’s grandson, John Sparry, over a period of years late in his life. 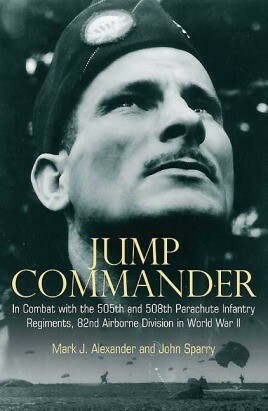 Providing valuable insight into the beloved commander who led three of the most infamous battalions in the US Army, Jump Commander also contains a wealth of new detail on 82nd Airborne operations, and casts insight on some of the most crucial battles in the ETO. This highly readable and action-packed narrative may well be the last remaining memoir to be written in the voice of a major airborne officer of the Greatest Generation.